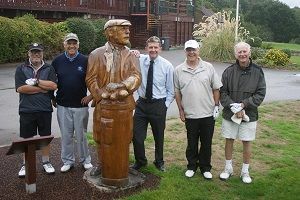 Over 170 players from across Cheshire enjoyed the splendid and challenging Alister MacKenzie course at Hazel Grove despite some cool and rainy conditions in the first Autumn Meeting for Cheshire Life Members. It provided a great contest with just two points separating the top six pairs. Out on their own with 46 points were Eastham Lodge’s dynamic duo of Joe Fildes and Ray Parry. Hot on their heels were Steve Marsh and Dave Sanders (Reddish Vale) and Mark Eden and Andrew Bennett (Tytherington), both 45, and Roger Hopton and Steve Chapman (Tytherington) and Wayne Colclough and Ian Lawton (Alsager), both 44. 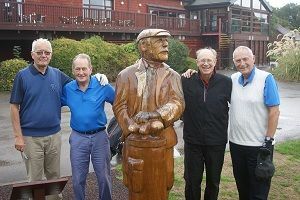 Also enjoying the day both on and off the course were Cheshire President Chris Moore (Royal Liverpool) and Cheshire Vice President Andrew Henshall (Wilmslow) who both paid their compliments to Hazel Grove for making this another special day for the Cheshire Life members.